Sometimes the best way to make your painting feel more colorful is by using the saturated colors sparingly in your composition. 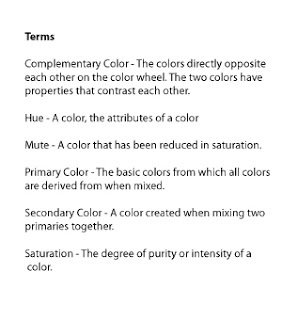 One way to reduce the saturation of a color is by mixing the complementary colors together to mute the color. All muting means is to reduce the intensity or saturation of the hue, bringing it closer to a neutral gray color. Placing a muted version of a color next to a more saturated hue will make the saturated color stand out. 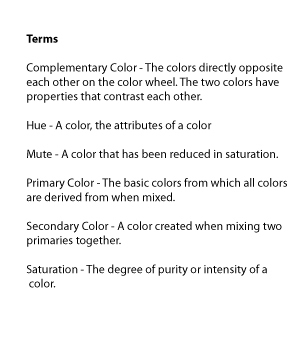 Lets look at color saturation and how to mute color using the complimentary colors. Mixing compliments to mute the colors is a natural way to reduce the saturation as each complement is the opposing color to the other. The complements do not share color traits and have properties that are that are in stark contrast to each other. Because of this, when you mix the two together you will neutralize the traits and end up with a gray. You can use this effect to lower the level of saturation of a color by mixing different levels of each complement together. For example, if you want to reduce the saturation of red add just a little bit of green and the color will move towards a more neutral color. It will remain red but will appear a little more gray in relation to the original red. This can be done with any color complement, but below is a chart the shows the primary and secondary color complements to illustrate this effect. In this chart, the complements are mixed in amounts to create gradual steps that mute the saturation from the primary color and its complement down to a neutral, shifting until the two mix equally into a gray. Muting saturation using complementary colors. Below the chart has been separated into the individual complements to better show how each complement impacts the other. Muting using the complements, red and green. Muting using the complements, yellow and purple. Muting using the complements, blue and orange. Try mixing the complementary colors yourself. In this exercise, I mixed red and green into seven steps of gradual mutes in between. 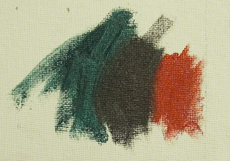 In this example, I used Viridian Green and Cadmium Red oil paint. 1. Start by painting drawing about nine squares onto a panel and paint the two outer squares with the green on one side and red on the other. 2. Then mix the two together to find the neutral and paint the center square with that neutral color. 3. Mix the colors until you get the color halfway between the neutral and the saturated color and paint that in the square that is halfway between the neutral and the saturated color. 4.Repeat this step for the squares on each side of that color you just painted. Mixing color complements is an easy way to reduce saturation and create less vibrant color as compared to the original. It is not the only way to do this, but it can be used to keep colors harmonious when mixing.